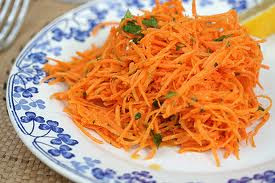 very fresh summer salad recipe, low calori, high vitamine. First: in a large bowl, toss together the carrots, pineapple, marshmallows, raisins and celery. Then whisk together the salad dressing and sugar; pour over salad and toss. Chill for at least 12 hours.